A small demonstration example for CUDA with OpenGL Pixelbuffer put together in a Qt4 Application. 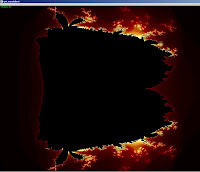 Source Project Solution VS 2010 "qt4_mandelbrot"
16.04.12: This example is "deprecated". I have reworked and bugfixed it for the Linux tutorial, see here. I will release the VS2010 edition soon, but you can copy the new source from the Linux tutorial. In my previous tutorial on Qt, CUDA, VS2010 I have shown you how to integrate all the libs together. You have been able to run an empty CUDA kernel in a Qt Application. It already has an OpenGL Widget (yet black empty screen). Now you want to create a 2D Image with Pixel-Fun-Stuff processed right on the GPU. OpenGL is just used as Presenter. How to connect .cu source with .cpp source ? How to calculate and paint the result on gpu side ? 1. Our cuda source is compiled by nvcc as you know. On the other hand we have classes in C++ such as our OpenGL Widget or our custom class SimplePBO which is our "Pixelbuffer-CUDA-Manager". Since SimplePBO accesses the kernel function in kernelPBO.cu, we have to declare the accessing function. This is done in globals.h. But there is a little restriction you should know: The Pixelbuffer Access is exclusive. Only one can access the pixel buffer at the same time, either CUDA or OpenGL. I also recommend presentation  about CUDA and OpenGL, especially the part starting on page 22 (Steps To Draw An Image From Cuda). You will see how to work with the pixel buffer in OpenGL and Cuda. In simplePBO.cpp::initCuda() the first cuda device is choosen ( cudaGLSetGLDevice(0) ). You will have to change on your own, if it doesnt fit. You can check your cuda devices with this little exe I wrote from : CUDA Device Checker (output on console). A more advanced GUI based CUDA Checker you can obtain here named as CUDA-Z. Ok, I do not want to explain every method here, just catch the code and explore the comments and consider the references [1; 3]. Last thing I want to mention is the image size. Due to the thread dimensions (16 per block) image size has to be a multiple of 16. So dont get confused about it. You also could set a fixed image size of 512 or 528 or something like that (see simplePBO.cpp::initCuda()).